My Fair Lady is now more “lovelier” than ever with a breathtaking new restoration playing in cinemas nationwide for a limited time only. In honor of its 50th Anniversary, this eight time OSCAR winning musical has been restored frame-by-frame from the original 65mm negative and scanned utilizing start-of-the-art technology under the supervision of Robert Harris (the famed film historian). 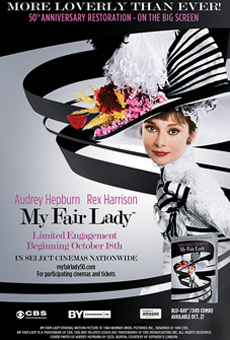 Audrey Hepburn has never looked more radiant than as Eliza Doolittle who finds herself at the center of a friendly wager between Professor Henry Higgins (Rex Harrison) and his companion, Colonel Pickering (Wilfred Hyde-White). Can this disheveled, cockney flower girl find her voice and blossom into a proper lady presentable in high society? Performance, style and sweet spirit…plus an unforgettable score… have made My Fair Lady one of the greatest musicals in film history and a beloved and timeless classic that begs to be experienced on the big screen. Bonus featurette (to air prior to film): The Fairest Fair Lady, a 10 minute theatrical trailer produced by Warner Bros. for the film’s original release will be added to the event screenings. The Fairest Lady takes a revealing and fascinating behind-the-scenes look at the remarkable efforts that went into making My Fair Lady.